“Eventorum is an opportunity for PUC students to get additional academic writing experience on topics that interest them, are current with their lives, and can help better-inform our campus as a whole,” Munson explains. Once a quarter, he meets with his students, who pitch ideas to the room. Once everyone settles on a topic, they set a deadline, and begin their research and writing process. The end goal is one article per student each quarter—source footnotes required. Though there is no monetary motivation for getting an article published on Eventorum, Munson says students are eager to gain experience and because they care about the topics. Bethany Erb, sophomore English major and pre-med student, has written three articles for the website on topics ranging from voting corruption in Venezuela, to the U.S. opioid epidemic, to the election of Brett Kavanaugh to the U.S. Supreme Court. Munson says contributing to Eventorum benefits writers because it motivates them to be more aware of often under-reported topics from around the world. “It is a great exercise in working with and evaluating sources for quality and bias,” he says. The published articles also help strengthen the students’ CVs and help improve and advertise their writing skills. Munson would like to see a series of improvements on the website this year, such as an email subscription tool and a contribution option. He would also like to see Eventorum become a means for current students to connect with PUC alumni, and aspires to form an editorial committee to include the departments of visual arts, English, and communications to help manage and develop the site more effectively than Munson can handle alone, and perhaps allow for more frequent contributions by a larger pool of students. 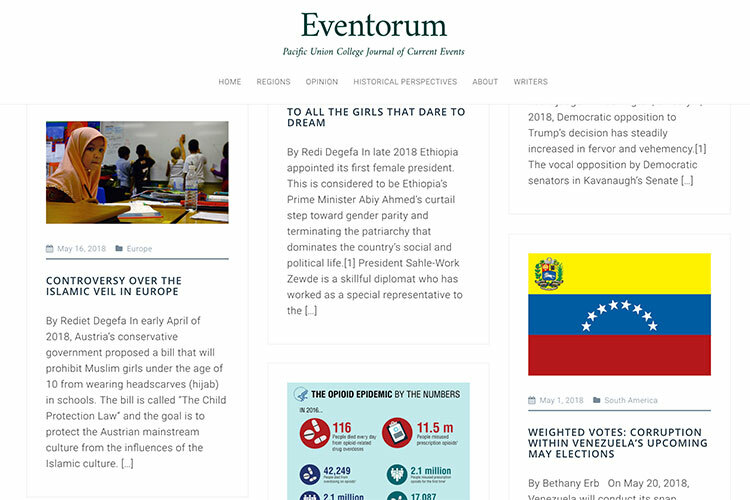 To read the full collection of student-produced articles, visit eventorum.puc.edu. To find out how you can support honest journalism and thoughtful discourse by student writers, contact Munson at hmunson@puc.edu.